Non-timber forest products (NTFPs), also known as non-wood forest products (NWFPs), minor forest produce, special, minor, alternative and secondary forest products, are useful substances, materials and/or commodities obtained from forests which do not require harvesting (logging) trees. They include game animals, fur-bearers, nuts, seeds, berries, mushrooms, oils, foliage, pollarding, medicinal plants, peat, mast, fuelwood, fish, spices, and forage. Research on NTFPs has focused on their ability to be produced as commodities for rural incomes and markets, as an expression of traditional knowledge or as a livelihood option for rural household needs, and as a key component of sustainable forest management and conservation strategies. All research promotes forest products as valuable commodities and tools that can promote the conservation of forests. The wide variety of NTFPs includes mushrooms, huckleberries, ferns, transplants, seed cones, piñon seeds, tree nuts, moss, maple syrup, cork, cinnamon, rubber, wild pigs, tree oils and resins, and ginseng. The United Kingdom's Forestry Commission defines NTFPs as "any biological resources found in woodlands except timber", and Forest Harvest, part of the Reforesting Scotland project, defines them as "materials supplied by woodlands - except the conventional harvest of timber". These definitions include wild and managed game, fish, and insects. NTFPs are commonly grouped into categories such as floral greens, decoratives, medicinal plants, foods, flavors and fragrances, fibers, and saps and resins. Other terms similar to NTFPs include special, non-wood, minor, alternative, and secondary forest products. NTFPs in particular highlight forest products which are of value to local people and communities, but have been overlooked in the wake of forest management priorities (for example, timber production and animal forage). In recent decades, interest has grown in using NTFPs as alternatives or supplements to forest management practices. In some forest types, under the right political and social conditions, forests can be managed to increase NTFP diversity, and consequently, to increase biodiversity and potentially economic diversity. Black truffle cultivation in the Mediterranean area is a good example of a high profitability when well managed. The harvest of NTFPs remains widespread throughout the world. People from a wide range of socioeconomic, geographical, and cultural contexts harvest NTFPs for a number of purposes, including household subsistence, maintenance of cultural and familial traditions, spiritual fulfillment, physical and emotional well-being, house heating and cooking, animal feeding, indigenous medicine and healing, scientific learning, and income. Other terms synonymous with harvesting include wild-crafting, gathering, collecting, and foraging. NTFPs also serve as raw materials for industries ranging from large-scale floral greens suppliers and pharmaceutical companies to microenterprises centered upon a wide variety of activities (such as basket-making, woodcarving, and the harvest and processing of various medicinal plants). Estimate the contribution of NTFPs to national or regional economies is difficult, broad-based systems for tracking the combined value of the hundreds of products that make up various NTFP industries are lacking. One exception to this is the maple syrup industry, which in 2002 in the US alone yielded 1.4 million US gallons (5,300 m3) worth US$D38.3 million. In temperate forests such as in the US, wild edible mushrooms such as matsutake, medicinal plants such as ginseng, and floral greens such as salal and sword fern are multimillion-dollar industries. While these high-value species may attract the most attention, a diversity of NTFPs can be found in most forests of the world. In tropical forests, for example, NTFPs can be an important source of income that can supplement farming and/or other activities. A value analysis of the Amazon rainforest in Peru found that exploitation of NTFPs could yield higher net revenue per hectare than would timber harvest of the same area, while still conserving vital ecological services. Their economic, cultural, and ecological values, when considered in aggregate, make managing NTFPs an important component of sustainable forest management and the conservation of biological and cultural diversity. Minority people in Vietnam, Myanmar, and Laos are living away from the mainstream settlements. The hill tribes and many other minority groups are closely associated with forests for centuries. Much of their household subsistence and part of the income is generated from the sale of a variety of NTFP products. In the highlands of Vietnam, NTFPs production is spread almost throughout the year, so provides a sustained income for the ethnic minority people. From June to August is the wild berry called uoi (Scaphium macropodium) collection that provides the bulk of household income. Every family sends several people into the forest on a regular basis during this period where they stay for 2–3 days during which 5–6 kg of berries are collected. A kilogram of dried berries (2–3 days of sun-dry) is sold for $1.50. The next comes bamboo shoots, mushrooms, and vegetable collection that goes through to February. The minority people in Sa Pa area depends mainly on a variety of NTFPs for their livelihoods. Among the products collected are fruits, berries, leaves, mushrooms, fish, bees honey, bamboo shoots, wild orchids and the list goes on. The Friday market is full of orchids and other wild plants put forward by these people for the tourists, both domestic and international, that flock there. Between 10-15% of the total household income is derived from the sale of NTFPs. The harvesting of leaves in the diet of family goes round the year where different species are readily available in specific months. Water from forest areas is yet another service that is useful in the livelihoods of these people. They have micro-hydro plants installed in streams that generate the much needed power for pounding (grain and seeds) and lighting too. 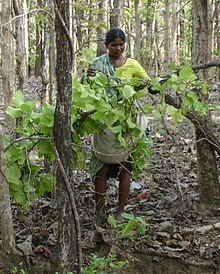 In the drier areas of Sri Lanka, the harvesting of curry leaves to be sold to traders is an important income. The harvesting of velvet tamarind (Dialium ovoideum) is an important income source to the rural people. This tree which is endemic to the country provides a fruit that has a high-popularity during certain months of the year. The returns from the sale of these two products is an important addition to the household incomes of rural people. Research on NTFPs has focused on three perspectives: NTFPs as a commodity with a focus on rural incomes and markets, as an expression of traditional knowledge or as a livelihood option for rural household needs, and finally, as a key component of sustainable forest management and conservation strategies. These perspectives promote forest products as valuable commodities and important tools that can promote the conservation of forests. In some contexts, the gathering and use of NTFPs can be a mechanism for poverty alleviation and local development. ^ "Non-wood forest products". www.fao.org. Food and Agriculture Organization of the United Nations. Retrieved 2018-06-30. ^ "Minor Forest Produce (MFP) - Arthapedia". ^ "Glossary of Forestry Terms in British Columbia" (PDF). Ministry of Forests and Range (Canada). March 2008. Retrieved 2009-04-06. ^ "Forest Research - Social, cultural and economic values of contemporary non-timber forest products: Wild Harvests". Forestry.gov.uk. Retrieved 2013-11-21. ^ "non timber forest products in Scotland". ForestHarvest. Retrieved 2013-11-21. ^ a b "Forests and non-timber forest products". Cifor.org. Retrieved 2013-11-21. ^ Bonet, Jose-Antonio; Oliach, Daniel; Fischer, Christine; Olivera, Antoni; Martinez de Aragon, Juan; Colinas, Carlos (2009). "Cultivation Methods of the Black Truffle, the Most Profitable Mediterranean Non-Wood Forest Product; A State of the Art Review". Modelling, Valuing and Managing Mediterranean Forest Ecosystems for Non-Timber Goods and Services. 57: 57–71. ^ Martinez de Aragon, Juan; Fischer, Christine; Bonet, Jose-Antonio (2012). "Economically profitable post fire restoration with black truffle (Tuber melanosporum) producing plantations". New Forests. 43 (5–6): 615–630. doi:10.1007/s11056-012-9316-x. ^ "SIC 0831 Forest Nurseries and Gathering of Forest Products". Encyclopedia of American Industries, 5th ed. Gale. 2008. ^ Peters, Charles M.; Alwyn H. Gentry; Robert O. Mendelsohn (29 June 1989). "Valuation of an Amazonian rainforest". Nature. 339 (6227): 655–656. doi:10.1038/339655a0. ^ Belcher, B.M. (2003). "What isn't an NTFP?". International Forestry Review. 5 (2): 161–168. doi:10.1505/IFOR.5.2.161.17408. Emery, Marla and Rebecca J. McLain; (editors). 2001. Non-Timber Forest Products: Medicinal Herbs, Fungi, Edible Fruits and Nuts, and Other Natural Products from the Forest. Food Products Press: Binghamton, New York. Jones, Eric T. Rebecca J. McLain, and James Weigand. eds. 2002. Non Timber Forest Products in the United States. Lawrence: University Press of Kansas.